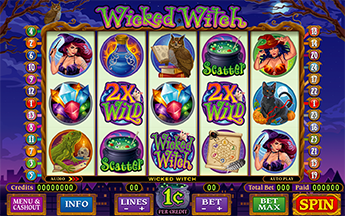 Wicked Witch is a spellbinding game that will have you mixing potions and casting spells! Fly to the bonus round on your broomstick, where you will pick between the Free Spin Bonus and the Bonus Chamber. Either one you choose will be magical! Choosing the Bonus Chamber Game will allow you to pick 3 out of 12 potions and win up to 100x total bet. 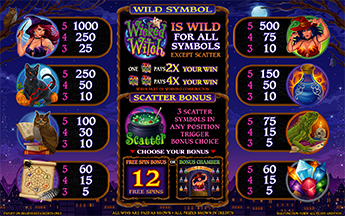 Choosing this feature will give you 12 Free Spins with two random wild reels per spin. Free Spins can be retriggered.